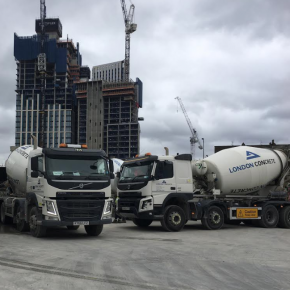 In the second largest continuous pour in its history, London Concrete (part of Aggregate Industries) has provided 5000 cubic metres of ready mix concrete to the exclusive One Nine Elms development in Central London. The pour – undertaken by Careys Civil Engineering, on behalf of principal contractor, Multiplex, over the course of a weekend – forms the basement raft of the 56-storey City Tower skyscraper that will provide luxury residential space on the banks of the Thames in South West London. The material was supplied by London Concrete’s Battersea site, with reserves held at its plant in Bow. Given the business of the area and time sensitivity, London Concrete was instructed to maintain a continuous supply of ready mix concrete, with no gaps or delays. Three months of meticulous planning with stakeholders, including Transport for London, in order to determine the least disruptive routes to site, meant London Concrete was able to supply the project with 680 loads of concrete without a single rejection, reworking or disruption to the public. Daniel King, MD at London Concrete, commented: “Developing a city as hectic as London requires careful planning and strategy. Our continued importance in the regeneration of the Nine Elms and Battersea area is testament to our collaborative approach with all stakeholders, from contractors to Local Authorities. Darren Potter, Head of Delivery at Careys Civil Engineering, added: “It was great to be a part of the largest continuous concrete pour in our history, completed non-stop over a 34-hour period, commencing late Friday night and finishing on Sunday morning. The weekend’s pour forms part of a contract for the supply of 25,000 cubic metres of concrete to the One Nine Elms development. The concrete was extensively validated to make sure that the deep concrete raft would not over heat. It included watertight concrete and carefully selected materials to reduce and control concrete temperature.